The Dunlop Blackstorm Graphite 2.0 is a racket with a great ball control. The racket is made of graphite and weighs only 135 grams. The Dunlop Blackstorm Graphite 2.0 is 20 grams lighter than its predecessor and you can notice the difference immediately. The racket feels incredibly light and is extremely agile due to the extra head light balance. Most weight is located in the bottom of the frame, making the Dunlop Blackstorm Graphite 2.0 very easy to manoeuvre. 4D Braided material is added at two important places in the frame of the Dunlop Blackstorm Graphite 2.0. 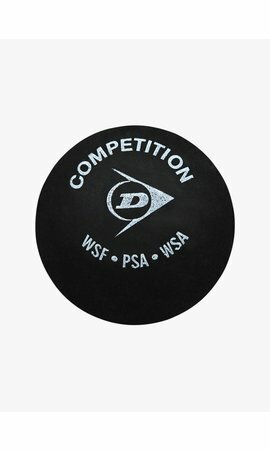 These ultra-light composite fibres are woven in four directions between the graphite and ensure that the torsion forces caused by the impact of the ball are highly reduced. The racket head of the Dunlop Blackstorm Graphite 2.0 is therefore extremely solid during a shot and this allows you to place the ball very accurately. Dunlop has reinforced the shaft area to make the racket even more stable. When you hit the ball with the Dunlop Blackstorm Graphite 2.0, you hardly feel any vibrations at all and this makes playing much more comfortable. The Dunlop Blackstorm Graphite 2.0 has a large racket head of no less than 500 cm2. Since the string bed is relatively large, the strings can move more freely and this provides extra power. The Dunlop Blackstorm Graphite 2.0 also has a slightly larger sweet spot (= the ideal spot to hit the ball) and is fairly forgiving. The racket has a string pattern of 16 x 19 and the spaces between the strings are therefore rather small, which enhances the ball control. The Dunlop Blackstorm Graphite 2.0 is ideal for players looking for a high-quality racket with excellent ball control. The racket is extremely solid and easy to play with. The Dunlop Blackstorm Graphite 2.0 comes with a full-size cover, equipped with a shoulder strap, in which you can safely store the racket when you´re not using it. Extremely solid and a great ball control.